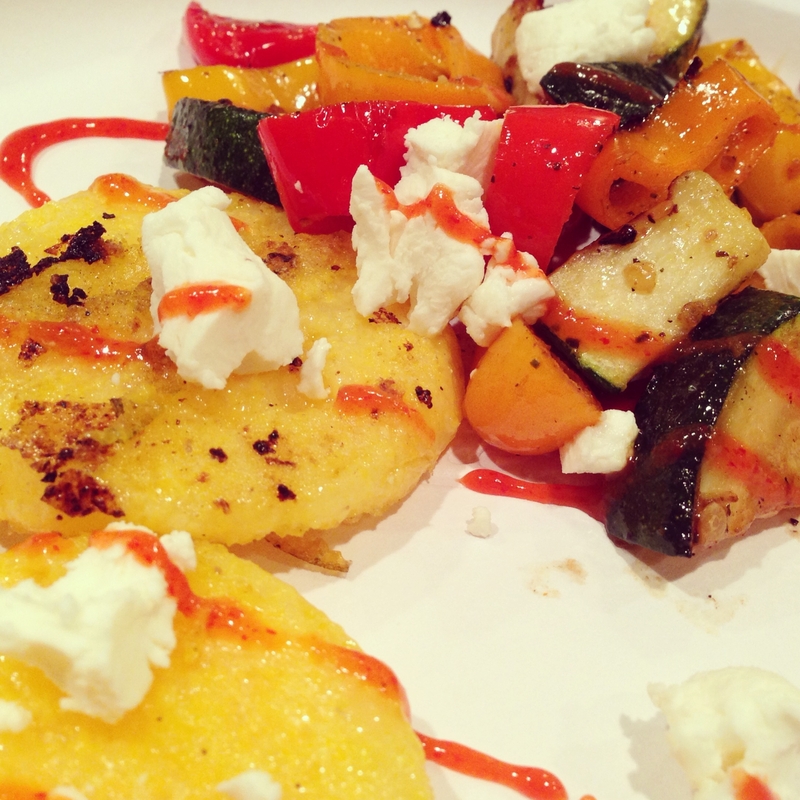 Polenta, which originated in Europe, is similar to grits as both are made from stoneground corn. 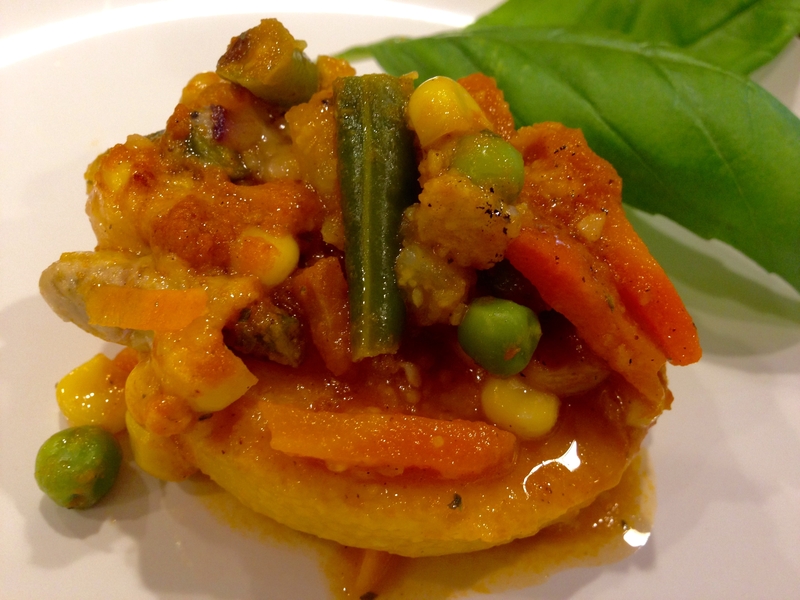 The type of corn for each varies as does the coarser texture of the cornmeal used to make polenta. 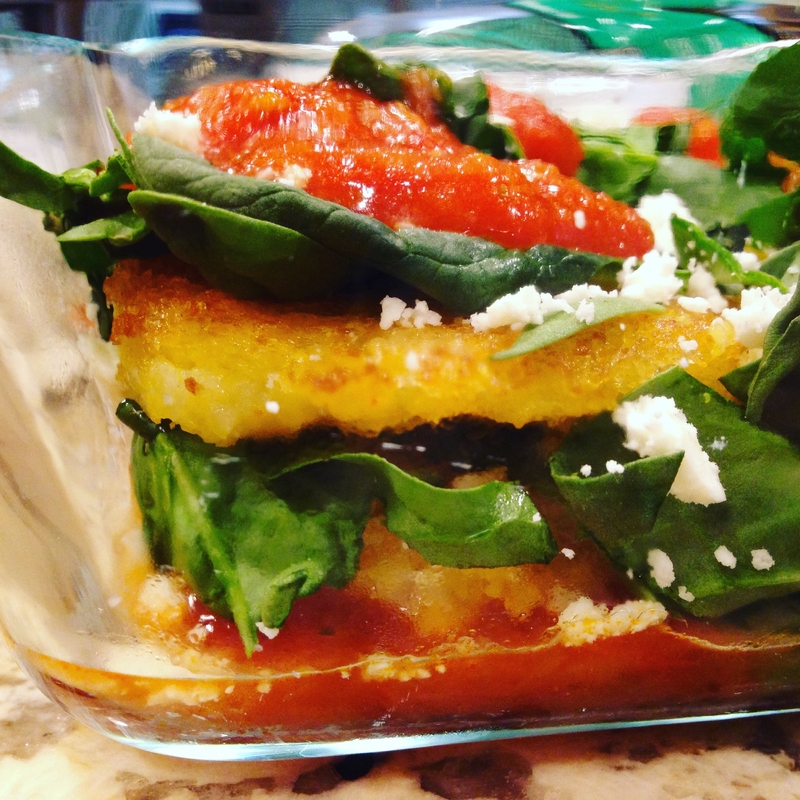 I consider polenta to be a great vessel for endless types of plates and add-ons. It is hardy enough to withstand grilling, frying, or baking and once cooked, the warm and creamier inside makes it comforting while the toasty skin gives a gourmet flare. 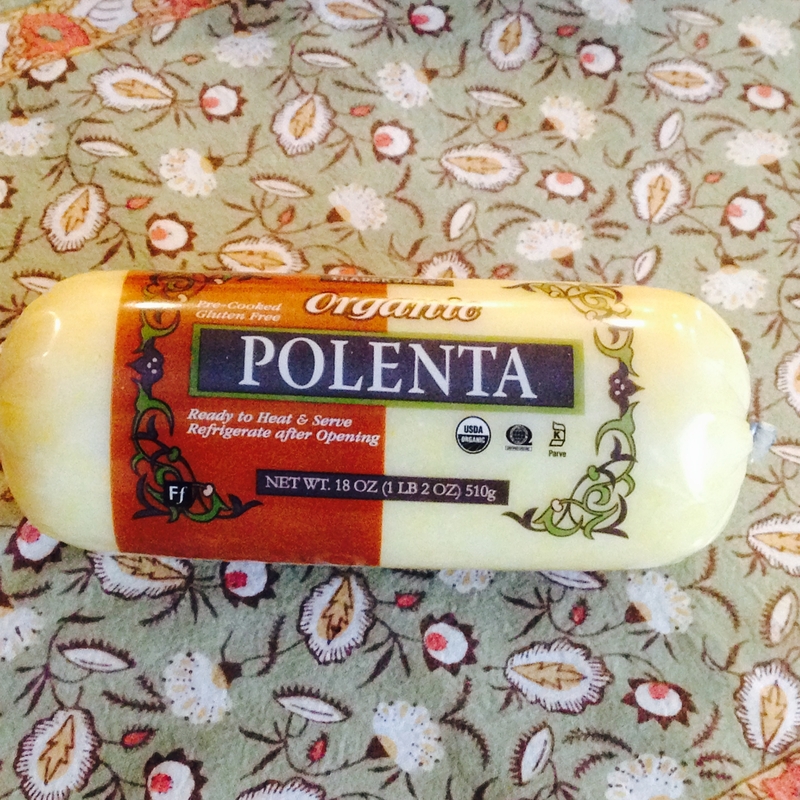 Less starchy than white potatoes, and suitable for anyone trying to reduce or avoid gluten, polenta is a fabulous choice. 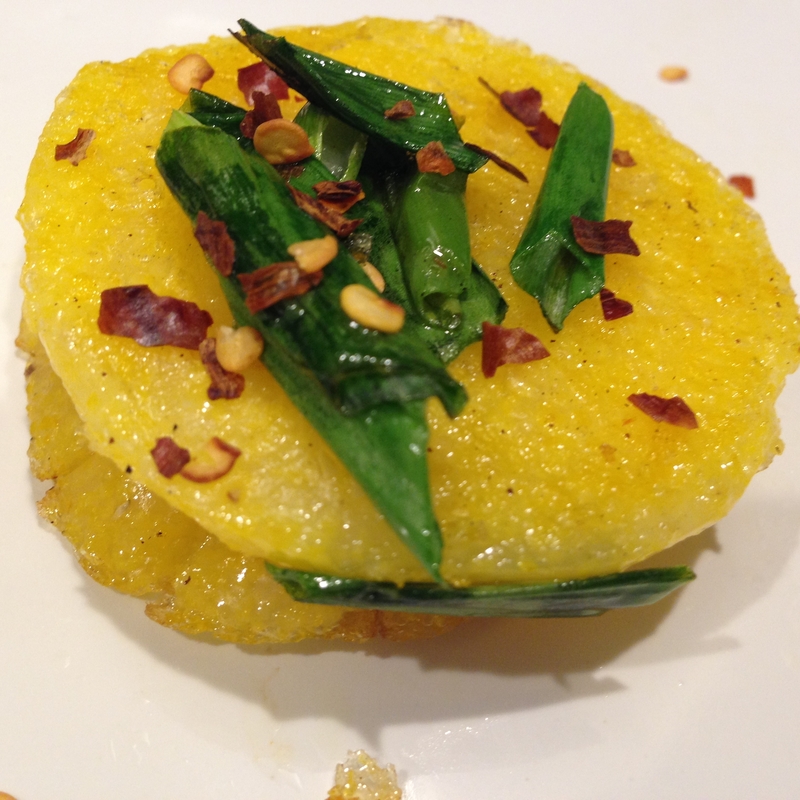 I have yet to experiment using polenta in a sweet way but have thoroughly enjoyed my savory tries! 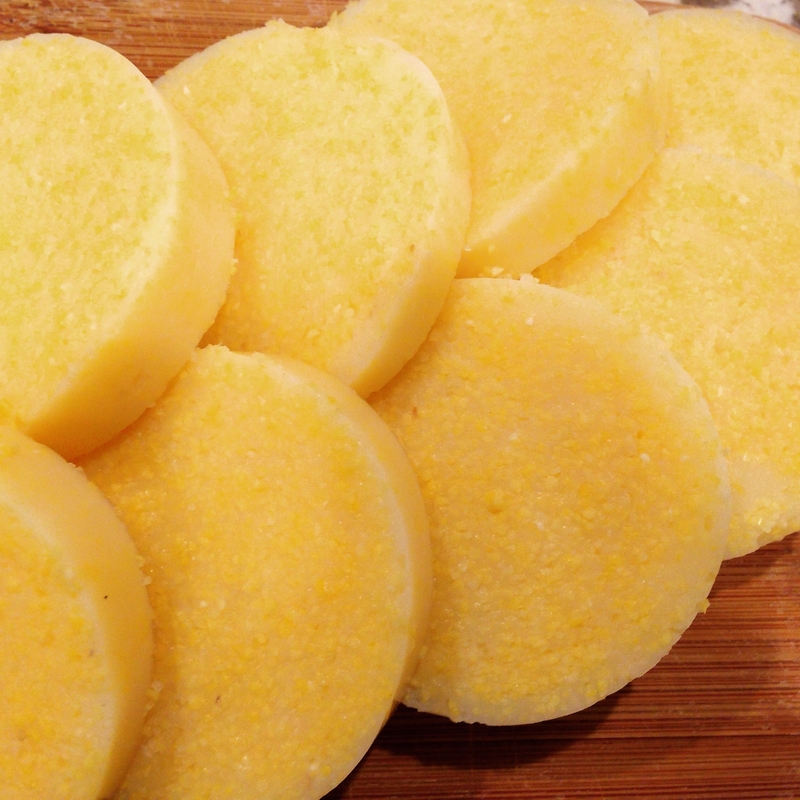 When polenta cools, it forms into a soft solid which can then be turned into different shapes. 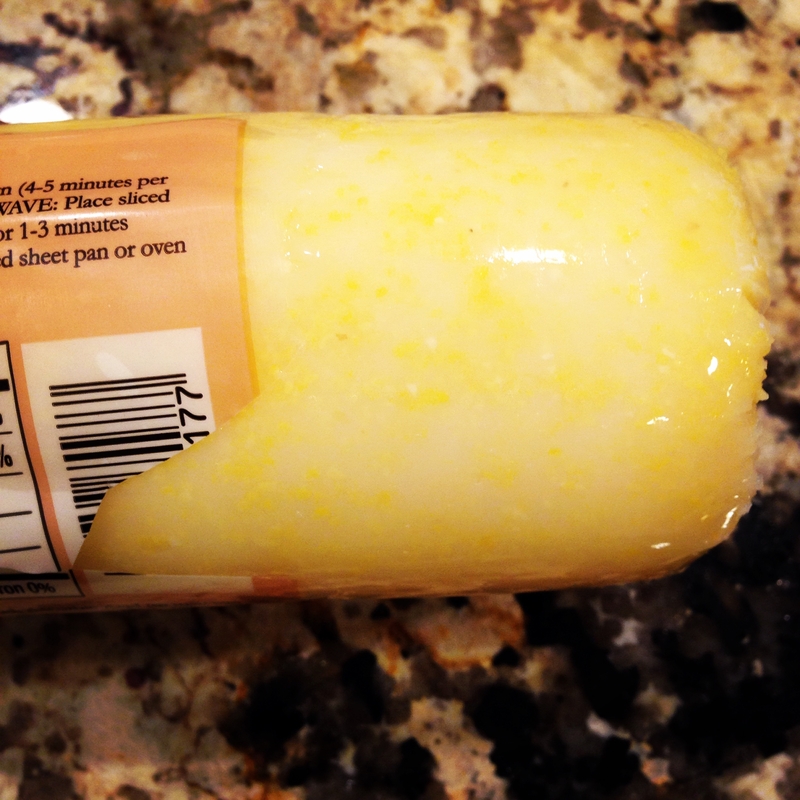 I keep these ready made logs in my cabinet for when I don’t have the time to make a pot of scratch made polenta. I usually need 1 for a side dish or 2 for a main dish. Most of the corn in this country is treated with Round Up (glyphosate) and genetically modified so you really want to aim for organic versions of anything corn based. I found this product least expensive at Trader Joe’s for around $2. I slice one end off with a knife and slide the rest out. Cutting it into 1/2 inch rounds facilitates both crisping up the most surface area and makes an adequate base for toppings. My favorite way to make it is in my cast iron pan for even cooking. 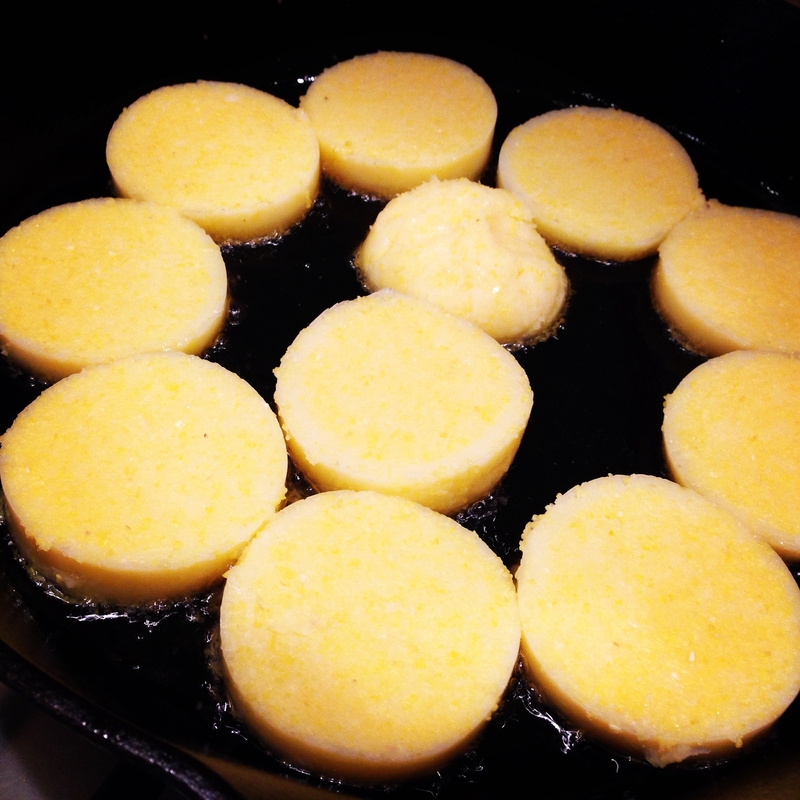 Because of the high water content of polenta, you have to be careful of the oil splattering. It takes some time to brown but the resulting crisp is worth it. 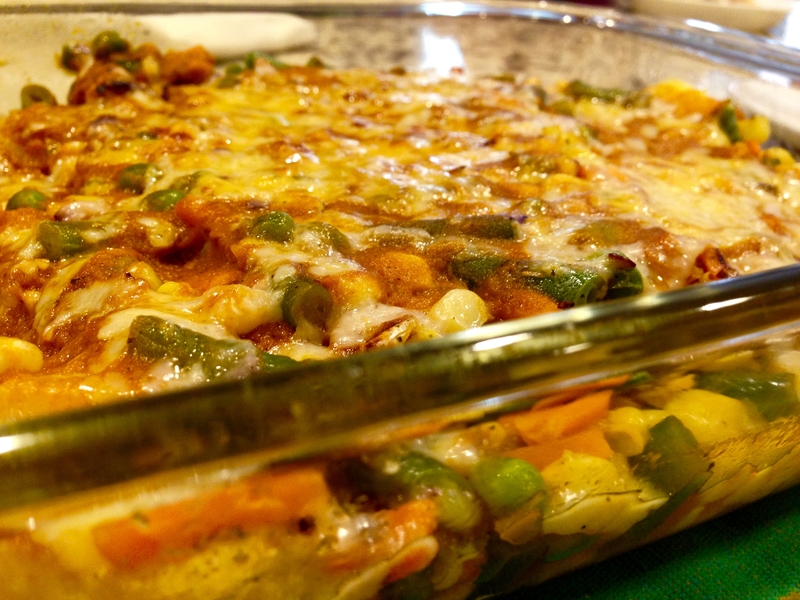 *Bonus recipe* ~ For the above casserole, I sauteed a bag of frozen mixed veggies with 2 tsp olive oil, 1/4 tsp salt, pepper, and 1/2 tsp garlic powder. I layered my favorite tomato sauce (1 jar) and the veggies in between cooked polenta rounds (2 logs), topped with shredded mozzarella cheese, and baked for 30 minutes on 375 degrees in the oven. With some basil on the side, it was a one dish hit! I plan on serving this over and over again. 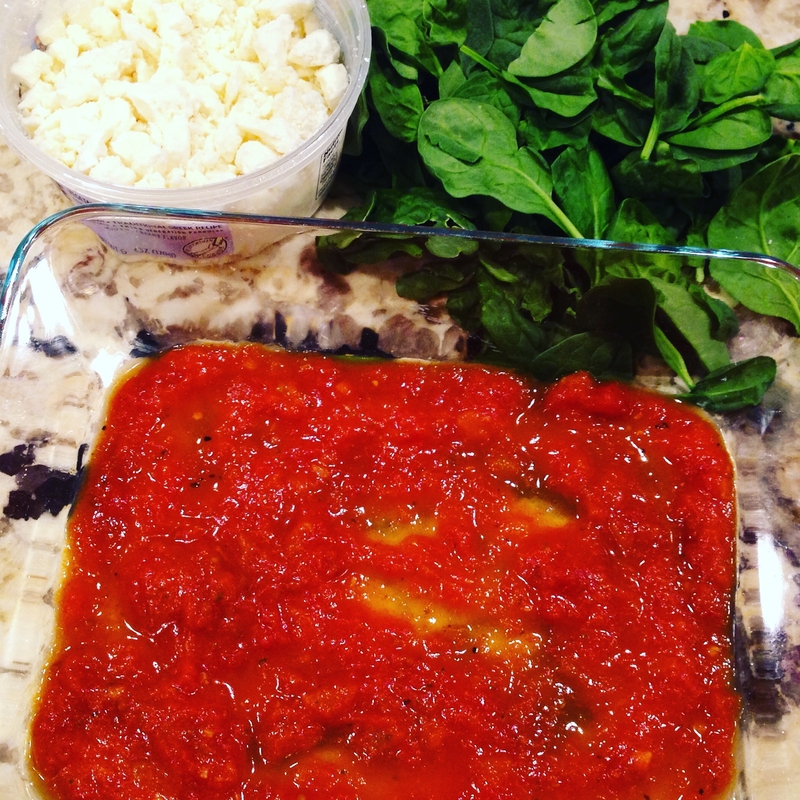 And my favorite version so far both for taste and meal planning, involves feta cheese, spinach (or any green of choice), and crushed tomatoes or pasta sauce. 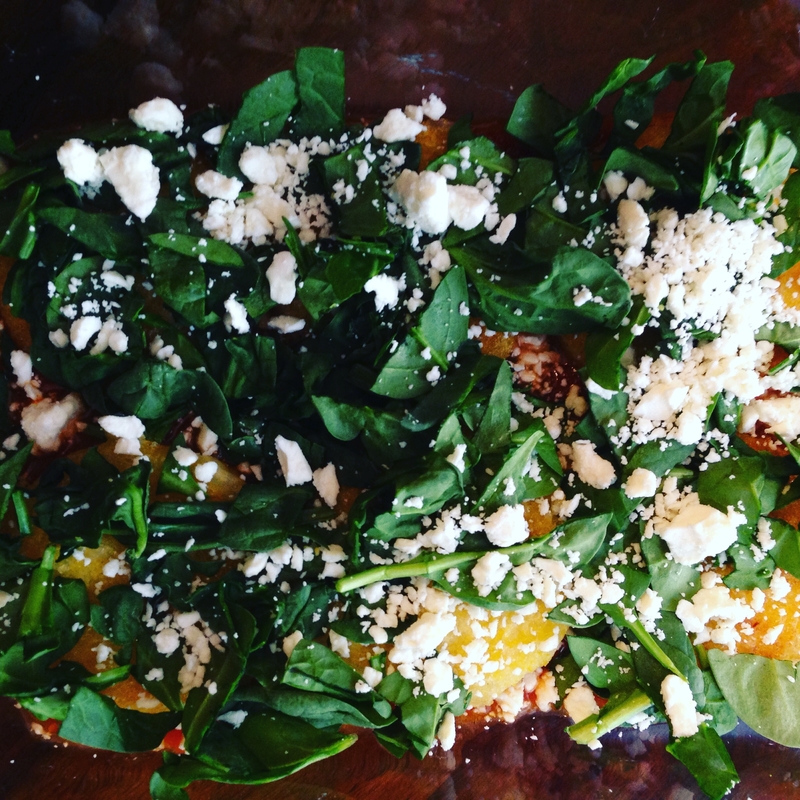 Bring to a potluck or friends/family during a busy time, serve as a side, or main dish, the mix of fresh greens, fried polenta, and tanginess of feta are Mediterranean and delectable. The colors and layered look provide a pleasant presentation. I made this in an 8 x 6 x 2 Pyrex glass dish/container. 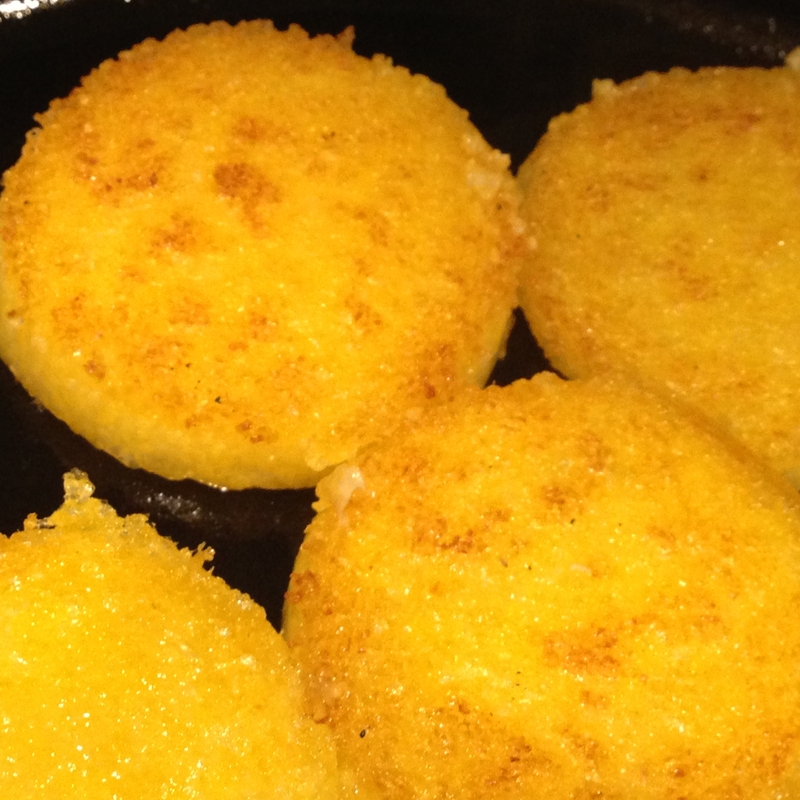 Carefully add polenta to pan and allow to cook for 10 minutes. Cover with lid or splatter screen if necessary. Flip and cook 10 minutes on the other side. You can cook it shorter if you are happy with just slightly golden. 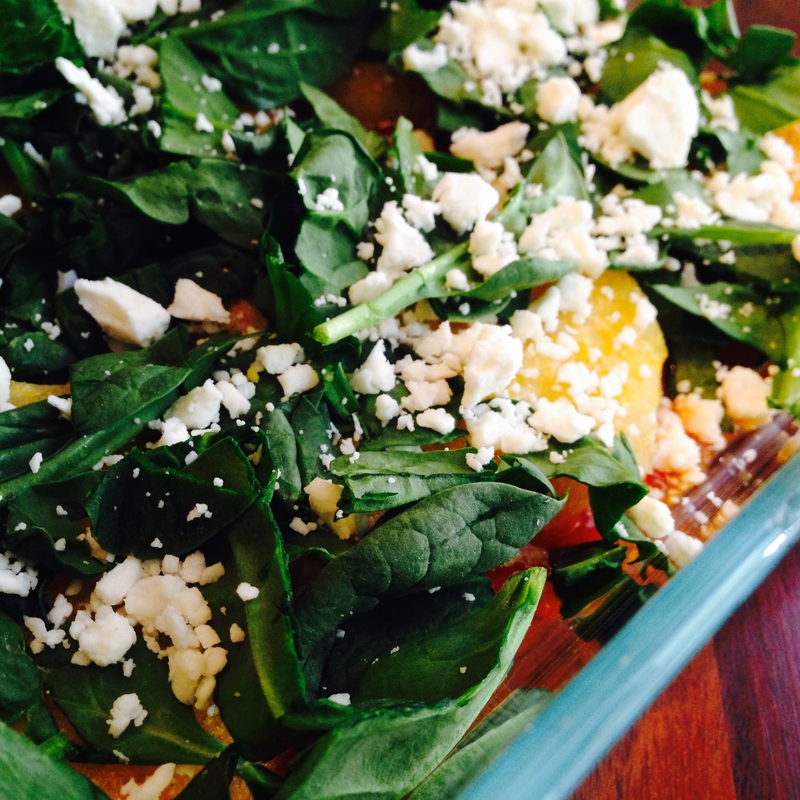 Pour 1/2 of the sauce into the bottom of your serving dish followed by 1/2 of the polenta, spinach, and feta. 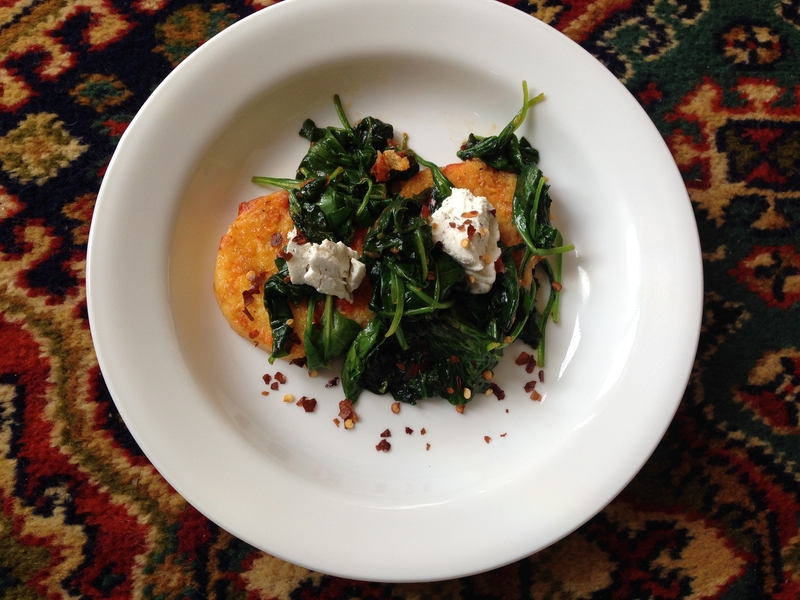 Repeat with the remaining sauce, polenta, spinach, feta and extra sauce if desired.